JEE Main Result 2019: The National Testing Agency (NTA) is to announce JEE Main 2019 Results by April 30. However, The NTA officials, as per the media reports, might declare JEE Main results 2019 soon on jeemain.nic.in. The JEE Main Result of Paper 1 will be declared online, where the test takers can check their results of JEE Main 2019 through the official link given in this page. 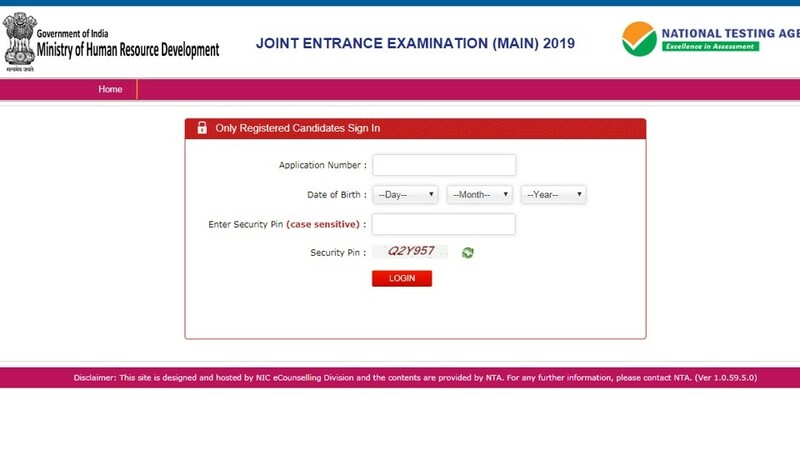 Candidates can access their JEE Main results 2019 by logging into their candidate accounts using the login credentials. While checking JEE Main 2019 results of Paper 1, candidates will be able to check their scorecard of JEE Main. Along with the declaration of JEE Main results, the NTA will also announce All India rank (AIR), All India Category Rank (CR) and cutoff score for appearing in JEE Advanced 2019. Further, JEE Main Results of Paper 2 will be declared on May 15. 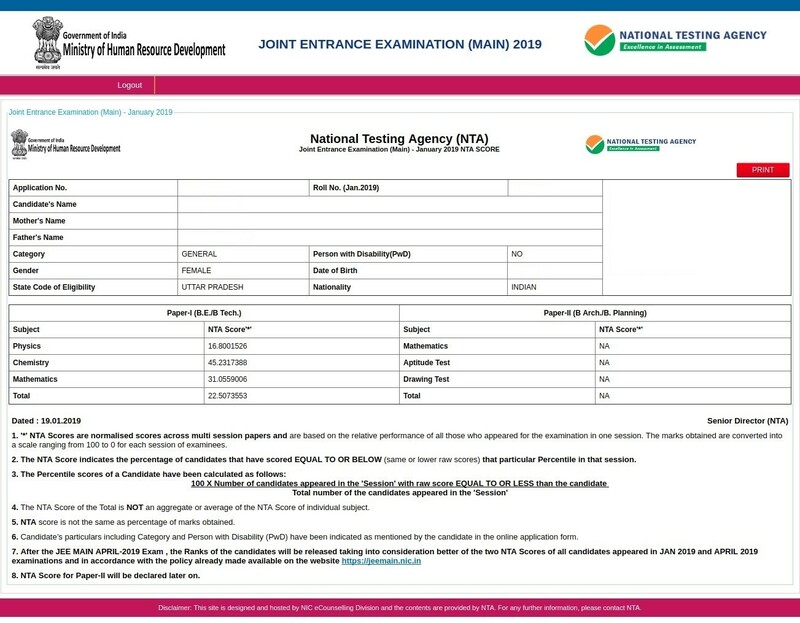 The NTA JEE Main 2019 scorecard will consist of the normalized JEE Main score of all three subjects as well as the total normalized score along with the rank of the test takers of Joint Entrance Examination-Main. The JEE Main Result 2019 will also mention the score obtained by candidates in first attempt held in January and second in April. 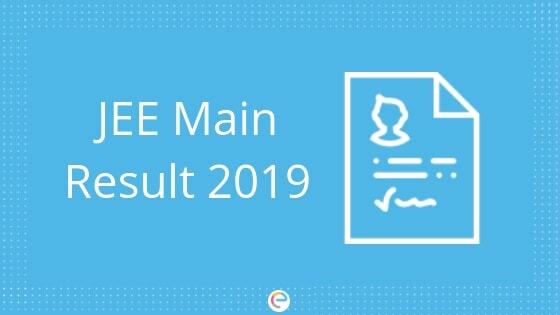 Here, we will provide you with all the necessary information regarding JEE Main result 2019. JEE Main result for Paper 1 consists of individual NTA scores of each subject (i.e, Physics, Chemistry, and Mathematics) and the total NTA score in JEE Main 2019. Since the JEE Main Paper 1 was conducted in multiple-sessions (8 slots spanning across 4 days), the raw scores will be normalized to the NTA score, which will be in percentile. Percentile score means the percentage of the total number of students appearing for the exam who have scored EQUAL TO OR LESS THAN the score you secured. This means, in each session, the marks secured by the candidate (out of 360 in the case of JEE Main Paper 1) is converted into a scale ranging from 100 to 0. The topper for each session will, thus, secure a percentile score of 100. Note that in case of the JEE Main April session results, the NTA score for the first attempt as well as for the second attempt will be merged for the compilation of result and for preparation of overall merit list / Ranking. The candidates who appeared in both the attempts, the best NTA score will be considered for further processing. The JEE Main score comprises of NTA scores of the first attempt and second attempt, the qualifying status, All India rank, and All India Category rank. JEE Main 2019 April session (JEE Main 2019 Paper 2) saw around 6000 more test-takers as compared to the January session. 9,35,741 candidates had appeared in JEE Main April exam while the January session recorded the number of 9,29,198 test takers. An exact reverse trend was observed in B.Arch paper (JEE Main 2019 Paper 2) where the number of registered candidates dropped from 1,80,052 in January to 1,69,767 in April, recording a dip of 10,285 registered students. JEE Main April 2019 Result will be released on the official website of jeemain.nic.in. So the candidates who have appeared for JEE Main 2019 exam must know how to check and download their JEE Main NTA Results 2019. Step 1: Visit the official website- jeemain.nic.in. Step 2: Hit on the button ‘JEE (Main) April 2019 NTA Score‘. Step 3: Enter your ‘Application Number, Date of Birth, and Security Pin‘ in the necessary fields. Step 5: Now your JEE Main 2019 April Results will be displayed on the screen. Step 6: Click on the option to download your JEE Main Score to download your JEE Main 2019 April score card. Along with the JEE Main 2019 Result, the officials will also release the JEE Main Score Card. The score card of JEE Main 2019 will contain details like candidates name, registration number, date of birth etc., Along with the basic details the JEE Main score card will also contain NTA score obtained in each subject. The AIR will be declared after the publication of JEE Main April Result. The officials will consider the highest rank for the candidates who have appeared in both attempts i.e., January & April session. Along with the basic details, the JEE Main 2019 Score Card also includes marks obtained in each subject i.e., Physics, Chemistry, Maths etc., The JEE Main Result contains only basic details. The JEE Main April Score Card contains state code of eligibility The JEE Main Score Card will be displayed on JEE Main April Result Page. JEE Main exam acts as a gateway for admission into various B.E/B.Tech programmes. More than 800 engineering colleges in India accept JEE Main score for UG admissions. JEE Main is also the preliminary or qualifying exam to appear in JEE Advanced which is for admission to the Indian Institutes of Technology (IITs). Candidates who wish to secure admission in IITs must appear for JEE Advanced exam. In order to appear for JEE Advance exam candidates must meet the eligibility criteria specified by the officials. And the most important eligibility criteria is for JEE Advance is that he/she should be among the top 2,24,000 by scoring minimum marks in JEE Main 2019 Paper-1. Those candidates who need to secure an admission in top engineering colleges like NITS, IITs, and GFTIs must clear the JEE Main exam compulsorily. The officials of NITs, IITs, GFTIs will announce the JEE Main cutoff that should be secured by a candidate for the purpose of admissions. Those candidates who clear the JEE Main Cutoff then they can seek admission in the National Institutes of Technology (NITs), Indian Institute of Technology (IIITs) and other Government Funded Technical Institutes (GFTIs). JEE Main Cut off is the minimum score that must be secured by candidates to qualify the exam. The cut off score varies as per the candidate’s category. The JEE Main cut off score to be declared on April 30 along with declaration of result. Candidates who will secure equal to more than the required cut off score as per their category will be allowed to appear in JEE Advanced. A total of top 2,45,000 candidates will be allowed to appear in JEE Advanced based on the cut off score of JEE Main. JoSAA will release the NITs, IIITs and GFTIs admission cut off based on JEE Main score tentatively in June. This cutoff will have the minimum ranks branch wise and category wise required by candidates for admission to undergraduate engineering programs offered by these institutes. The table below shows the last year category wise JEE Main Cut off. JEE Main 2019 cutoff scores will be released with the JEE Main results. However, let’s go through the previous year JEE Main cutoff to have an idea regarding JEE Main cutoff scores. As JEE Main 2019 Paper 1 is conducted in multi-shifts, NTA scores is calculated corresponding to the raw marks obtained by a candidate. The calculated NTA scores for all the shifts/sessions are merged to prepare the JEE Main result of paper 1. Normalization procedure based on Percentile Score to be used while preparing the JEE main result 2019 so to adjust the difficulty level of the various slots of examination. Percentile scores are scores based on the relative performance of all candidates who appear in the exam. Basically, the marks obtained are transformed into a scale ranging from 100 to 0 for each session of examinees. While JEE Main result calculation the percentile score will be the normalized score for the examination instead of the raw marks of the candidate and it will used for the preparation of All India rank and category wise rank. The Percentile Scores will be calculated up to 7 decimal places to avoid bunching effect and reduce ties. At Embibe, we provide score improvement guarantee in just two tests. With RANKUP, you get personalized guidance that helps you improve your academic knowledge and your skills to take the exam in the most effective way. Simultaneously, if you want then you can take JEE Main mock tests and solve JEE Main practice questions on Embibe. Embibe also provides JEE Main study material that includes description, the best video tutorials, important and previous year questions, questions rankers got wrong, etc. Candidates appearing in JEE Main 2020 must read the JEE Main analysis of the offline paper and get an idea about what to expect and how to prepare. They must also take the JEE Main previous year papers and see how much they are scoring. This will give them an idea about their JEE Main result. We hope this detailed article on JEE Main result 2019 helps you. If you have any query regarding JEE Main result 2019, drop a comment below and we will get back to you.